The U.S. Air Force’s Space and Missile Systems Center (SMC) Global Positioning Systems (GPS) Directorate achieved a major program milestone on August 21, successfully delivering the first GPS III satellite to Cape Canaveral Air Force Station, Florida, to initiate launch processing. The satellite, dubbed “Vespucci” in honor of Amerigo Vespucci, the Italian explorer for whom the Americas were named, was transported in a custom container from the Lockheed Martin factory facility in Waterton, Colorado, to the Space Coast Regional Airport in Titusville, Florida, by a C-17 Globemaster III that originated from Joint Base Lewis-McChord, Washington. 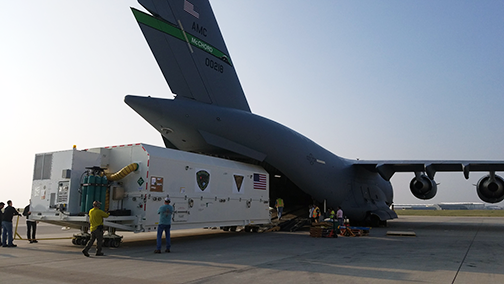 The transportation crew consisted of contractor and government personnel who oversaw the entire operation to ensure that the conditions of the transport environment would not damage any of the satellite’s sensitive components. A government and contractor team loads the first GPS III satellite for transport aboard a U.S. Air Force C-17 Globemaster III from Joint Base Lewis-McChord, Washington, Aug. 20 at Buckley AFB, Colorado to begin processing for a December launch aboard a SpaceX Falcon 9 rocket at Cape Canaveral Air Force Station, Florida. Photo is courtesy of U.S. Air Force — Lt. Col. Erin Gulden. Colonel Steven Whitney, Director of the GPS Directorate, added that while the launch of the last GPS IIF satellite marked the end of an era, the upcoming GPS III launch will be the start of a brand new one. This is the first of the Air Force's new GPS III satellites, the first to integrate with a SpaceX rocket, the first to interact with elements of GPS’ Next Generation Operational Control System (OCX) Block 0, and the first to have spacecraft acquisition and on orbit checkout from Lockheed Martin facilities.